On Sunday, January 17th, my Posse and I (first years from Chicago) participated in a community supper at the Congregational Church. After weeks of planning and some initial preparation the night before in the form of creating a music playlist, grocery shopping, and baking ten dozen brownies, our group was excited to work together serving the Middlebury Community. To make operations smoother, we divided into different roles: dishwashers, cooks, cutters, and servers. We began our day setting up the long meal tables with floral decorations and tableware. Other members of the Middlebury community, friends, and community leaders assisted us. Our menu consisted of chicken parmesan, two types of pasta, salad, bread, clementine, and chocolate desserts. Preparing the food for 200 community members taught us how to work effectively as a team and be diligent. Knowing each other well through Posse made it quicker to work and be honest about what we needed from each other to serve everyone who expected a good meal. 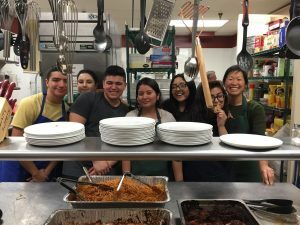 The biggest lesson of the community supper was acknowledging how important it is to engage with community members that aren’t students of Middlebury College. Living in a college campus often blinds us from connecting with Vermont locals and learning about their challenges and hearing their stories. We all learned how hardworking the community members are and we put to rest any preconceived notions we had of the community; we found that there is tremendous diversity in the Vermont experience. Engaging with the community gave us a new understanding of Addison County and opened our eyes to the privileges we have being in Middlebury as students and how beneficial it can be to reach out and have events that give back to community members. After cleaning up and reflecting on our experience the following week, we hope to further our community engagement with locals and demonstrate our leadership as Posse scholars! Thanks, in part, to the Service Cluster Board Flex Fund for the generous grant to help make purchasing groceries possible, and to the Charter House Coalition and Congregational Church team for welcoming us so warmly.